CinemaCon, previously known as ShoWest, takes place this week in Las Vegas. Movie exhibitors from around the U.S. and the world are attending this year’s exhibition which will showcase new in-cinema technology along with a bunch of first looks at various movies coming both this year and next. 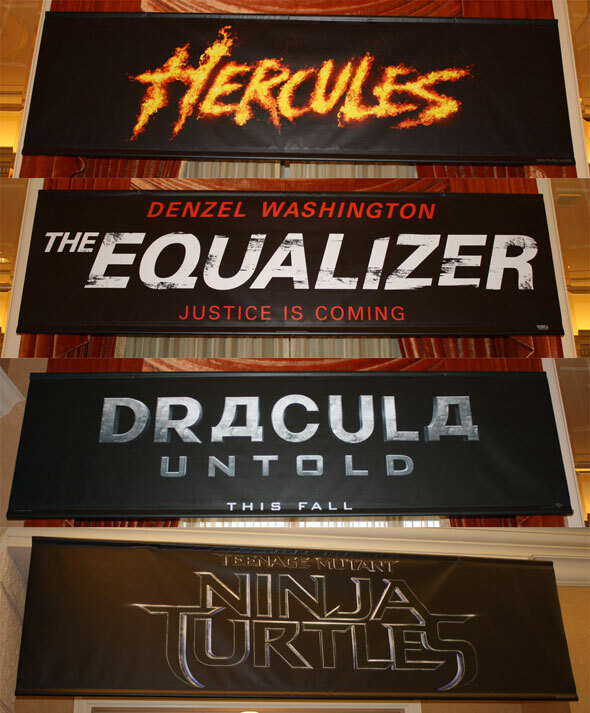 Collider have posted up photos of the ‘logo reveals’ for four major upcoming titles – Brett Ratner’s “Hercules” starring Dwayne Johnson, Antonine Fuqua’s “The Equalizer” reboot starring Denzel Washington, the revisionist “Dracula Untold” starring Luke Evans, and the latest take on the “Teenage Mutant Ninja Turtles”. The last of these confirms they’re keeping the full title and not shrinking it to just “Ninja Turtles” as speculated.